Read articles written by very well-known personalities and eminent authors about Health and Hygiene. The concept of 'Sanitation' is a comprehensive one including effective management (collection, treatment and disposal/recovery, reuse or recycling) of human waste, solid waste (including biodegradable and non-biodegradable refuse/trash/rubbish), waste water, sewage effluents, industrial wastes, and hazardous (such as hospital, chemical, radioactive, plastic or other dangerous) wastes. The standards of sanitation in a society are closely inter-related to the levels of hygiene and public health in it and, hence, to the attainable standards of longevity and extent of diseases, and thus to the productive levels of the society. These also determine the levels of avoidable wastages of available resources and to what extent the so-called wastes are being recovered/reused/recycled as valuable resources. Lack of sanitation, which includes lack of cleanliness and causing dirt, filth and pollution, has not only vital economic consequences but also serious social consequences. Mahatma Gandhi had realized early in his life that the prevalent poor state of sanitation and cleanliness in India and particularly the lack of adequate toilets, in the then largely rural India, needed as much attention as was being devoted toward attainment of swaraj. He said that unless we "rid ourselves of our dirty habits and have improved latrines, swaraj can have no value for us." [CW 14:56-58] Along with the struggle for India's independence, he led a continuous struggle for sanitation, cleanliness, and efficient management of all categories of wastes throughout his public life (1893 – 30.1.1948), in South Africa and then in India. He dealt with nearly all aspects of sanitation-technical, social and economic-and its various aspects-personal, domestic and corporate. Gandhi was martyred soon after India became independent. After independence, the issue of sanitation has received the government's attention though sporadically. Such facilities need to be further upgraded. In this background the Prime Minister's speech on the Independence Day (15.8.2014) brought fresh hopes: "How do we celebrate 150th birth anniversary of Mahatma Gandhi? 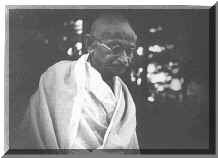 - - - Mahatma Gandhi had cleanliness and sanitation closest to his heart. Whether we resolve not to leave a speck of dirt in our village, city, street, area, school, temple, hospital, and what have you, by 2019 when we celebrate 150th anniversary of Mahatma Gandhi? This happens not just with the Government, but with public participation. That is why we have to do it together." This resolve was concretized when on 2 October, 2014, the Prime Minister launched a nationwide sanitation campaign, 'Swachh Bharat Abhiyan'-'Clean India Mission'-to provide sanitation facilities to every Indian, including toilets, solid and liquid waste disposal systems, village sanitation, and safe and adequate drinking water supply by 2 October, 2019. The Gandhian movement for 'Sanitation' (1893 – 30.1.1948). The movement for 'Sanitation' after Independence in 1947 till the present time. Throughout this period, Gandhi also remained deeply involved with how to get rid of the general assertion by the white settlers-partly motivated by reluctance to give equal opportunity to the Indian settlers (traders, labour and other groups)-that Indians did not follow sanitary and hygienic practices and, hence, should be made to live in separate 'locations'. Those days epidemics, such as plague, were recurrent, which made it even more necessary that rules of sanitation and cleanliness were observed. Gandhian movement for sanitation had taken a much more active form by the time he came out of the jail in 1924. He even said, "Outward filth is only a sign of the uncleanliness in our minds." [CW 43:410] His incessant drive during this period may be studied under three broad categories: a) sanitation as a system and a movement (e.g., its role in freedom movement, Indians and sanitation, lessons from the West); b) sanitation in specific situations (e.g. in cities, in villages, on Railways, in Gandhian ashrams and Congress sessions); and c) the associated issue of 'untouchability' and its 'removal'. His observations and actions during this period are briefly given below for each category. In this phase, Gandhi led an all-India movement for 'Removal of Untouchability' and instituted an 18-point 'Constructive Programme' which included apart from 'Removal of Untouchability, 'Village Sanitation' as well as 'Education in Health and Hygiene'. Gandhi even went on 'fast unto death' for recognition of 'untouchables' as equal part of the Hindu society and then set up Harijan Sevak Sangh and undertook an all India tour for 'Removal of Untouchability'. Hence, during this phase, his work about sanitation was largely related to providing social equality to the bhangis, and the subject of 'Village Sanitation', while he continued to push his systemic programme of sanitation in all spheres of Indian life. During this period, India was on the door-step to Independence. While Gandhi was deeply involved in the political processes and efforts to mitigate communal violence, he also continued to propagate his drive and efforts for sanitation, cleanliness and hygiene. In this period, while most of his references dealt with the subject in broad terms including specific references to the subject of composting the wastes and to sanitation in refugee camps, he also kept referring to the sad plight of scavengers and to village sanitation. The term 'sanitation' today means safe, hygienic, effective and economical management--collection, storage, treatment and disposal, including recovery, reuse and recycling--of all categories of 'wastes' (rural, urban, and other), primarily including human wastes, solid wastes, wastewaters, sewage effluents, industrial wastes, and 'hazardous' wastes; keeping in view that 'a waste is a resource out of place'. For rural sanitation, Government of India's Ministry of Drinking Water and Sanitation acts as the nodal agency for overall policy, funding and co-ordination, while the states are vested with the responsibility of programme implementation. In most states, the Rural Development or the Public Health Engineering department is made responsible for managing the rural sanitation programme called Nirmal Bharat Abhiyan (NBA)-to transform India into 'Nirmal Bharat' by people-centred strategies with emphasis on awareness creation or sanitation facilities in houses, institutions and schools. A notable effort at all India level by a non-government initiative came from Dr. Bindeshwar Pathak who, inspired by Gandhi, did extensive studies on the subject after joining the Gandhi Centenary Celebration Committee in Bihar in 1969. Those days, there were hardly any toilets in rural households and schools in Bihar. Women were the worst sufferers as they had to go for open defecation before sunrise or after sunset. A large number of children died due to diarrhea, dehydration, dysentery, cholera, etc. In the late 1960s, 23 out of 48 cities with population over 1 lakh in India had sewerage system. Under his consistent efforts was developed the 2-pit pour-flush compost water-seal latrine with on-site disposal system, called 'Sulabh Schauchalaya' (SuSh). One pit is used at one time, and when it is full, the second one is used, and contents of the full pit in the meantime become manure. It uses 1 liter water to flush after use and there is no manual scavenging. It is a decentralized, affordable, and efficient sanitary substitute for open defecation and bucket latrines. Though the concept of 'public' toilets was covered in the Bengal Municipal act, 1876, (amended in 1888) providing for community toilets on 'pay and use' basis, it had not taken off. Dr. Pathak revived the concept in Bihar in 1974 with a system of community toilets with bathing and urinal facilities, called Sulabh Schauchalaya Complex (SSC), with round-the-clock service and without any burden on public exchequer for their operation. SSCs are being provided in public areas such as bus-stands, railway stations, markets, and hospitals. The practice of manual scavenging was prohibited in 1993, the Act providing for imprisonment up to 1 year and fine of Rs. 2,000 or both; it has still to be fully eliminated. Nevertheless the data on the number of manual scavengers is ad hoc and incomplete. As mentioned earlier, the Prime Minister had announced on Independence Day (15.8.2014) that Swachh Bharat Abhiyan will be started from Mahatma Gandhi's birth anniversary (2.10.2014) under which we resolve to provide sanitary toilets and basic sanitation to all by the 150th birth anniversary (2019) of Gandhiji. He had also said in his Independence Day address that "we are living in 21st century. Has it ever pained us that our mothers and sisters have to defecate in open? - - The poor womenfolk of the village wait for the night; until darkness descends, they can't go out to defecate. - - - - when the hopes are not fulfilled, the society sinks into a state of despondency." One task to start today: all schools to have toilets. He also asked people to take the pledge: "I shall not litter and won't allow anyone to do so". No open defecation. MP Local Area Development (LAD) Fund for 1 year be used for toilets in schools, apart from the provision of funds by the governments and under CSR. The mission: by 2019, toilet in every home, thus, in 12 crore households, toilets to be constructed by 2019. All waste-water to be released into water bodies only after treatment. Ban on defecation/ urination etc. on the banks of streams-as a punishable offence, provision of adequate toilets on the banks, and legal ban against throwing plastics, garbage, etc. into a stream. Subsidy for construction of toilets to be linked to current prices, and paid through banks; such subsidy or loans may be given to middle and upper classes also. Adequate number of toilets and urinals at all public and institutional units, such as educational institutions, railway stations, bus stops, trains, etc. There are already signs of active initiatives being considered to fulfill the foremost aim of the Swachh Bharat mission. For example, the Maruti Suzuki Co. was given 'Excellent Sanitation and Toilet Award' at India Sanitation Summit 2015 for having decided to build 200 toilets in villages, thus eliminating open defecation there, by 2017 under its 'Corporate Social Responsibility'. Indian Railways (IR) had already planned to have bio-latrines in all trains by 2021-22. The first train, Uzhavan Express was flagged off with 34 bio-latrines on 1.9.2013. IR has, in collaboration with the Defence Research and Development Organization (DRDO) developed the whole design of bio-latrines for trains, the waste from which will be treated by anaerobic digestion, the resultant biogas being released and water being chlorinated and then expelled. IR has recently announced that as part of the Swachh Bharat mission, during next 2 years toilets will now be fitted in all trains. Also, as a start, the sections Jammu – Katra and Kanalus – Dwarka – Okha will be made 'no discharge of the defecation on the tracks' by 2 October 2015. In Bihar, the state government has decided that anyone living in a house without a toilet will not be allowed to contest a municipal or panchayat election. It has planned to provide all homes with toilet by 2019. Such examples are encouraging. However, it has yet to be ensured that the tasks under the Swachh Bharat Abhiyan are clearly defined and systems put in place for timely fulfillment. The article gives a brief review of the important initiatives made during over last 100 years to pursue the objective of sanitation, including its hygienic, social and economic aspects, in India. It started soon after Gandhi's arrival in South Africa in 1893, and till 1914, with his growing involvement in inducing sanitary practices among Indians there, in both personal and corporate spheres, also as a safeguard against the then recurrent epidemics like plague, and including making scavenging as a respectable duty of every person. This also prepared him for his widespread movement for sanitation in India from 1915 onwards till his martyrdom (30.1.1948). His movement in India was multifaceted but was obviously related to the situation of his time, when India was mostly a rural and under-developed country. At the practical level, his efforts covered mostly the issues of providing sanitary latrines in homes and the safe disposal of human waste as manure, rural sanitation, and the social issue of 'untouchability' as linked to the practice of an isolated caste group being condemned to look after scavenging and other such 'dirty' tasks. At the conceptual level, Gandhi was remarkably modern and remains equally relevant today. He interlinked the issues of sanitation, cleanliness and hygiene with the issues of waste generation and its management. He was probably the first leader to repeatedly emphasize that, the responsibility for sanitary living applied equally at personal, domestic, and corporate levels. He even said that that unless we "rid ourselves of our dirty habits and have improved latrines, swaraj can have no value for us." [CW 14:56-58] He defined waste or dirt as "matter displaced", and persisted that, as far as possible, all wastes should be appropriately recycled as useful resources. Thus, he wanted all human waste, dung, refuse and other bio-degradable waste to be converted into 'goldlike' manure. He advocated scientific approach in all aspects of sanitation and wanted India to learn from the West in the matter of sanitation. He adopted "cleanliness is next to godliness" even as a student but later changed that into "cleanliness is godliness". He wanted his followers to take up "the whole subject of economic waste" occurring through ways such as preventable diseases, wrong feeding, and loss of valuable resources as wastes. He considered the task of scavenging as the noblest, even higher than what a mother did for her babies. After India became independent, Government of India and state governments as also some non-government entities, notably Dr. Bindeswar Pathak's Sulabh International, have been working in order to promote sanitation in India. The government agencies have been taking up varied programmes, which have certainly made their impacts, but as the needs and dimensions of concern have also been growing these impacts have been increasingly inadequate to address the scale and range of issues related to sanitation requiring urgent attention. Gandhi had started his movement for sanitation in India in 1915. Since then India's population has grown 7 to 8 times, Indian society has progressively urbanized, and socio-economic structures have been modernizing and moving towards the global standards of developed countries. Hence, both the categories and complexities of the problems concerning lack of sanitation and wastes too have been growing. Provision of sanitary toilets for all, particularly for the rural and slum (urban) populations, and of 'public toilets', and management of human wastes (night-soil and urine) including all its aspects. Management of Municipal Solid Wastes (MSW), covering each of its major categories, such as, biodegradable wastes, non-biodegradable wastes, construction and demolition wastes, and 'hazardous' wastes (e.g. hospital and medical wastes). Management of wastes from small-scale to large-scale industries and mines, also including wastes from processing units, cattle farms, slaughter-houses, tanneries etc. Management of waste-waters and drainages, including sewerage systems and related sewage treatment plants and septic tanks, and storm water drainage. Management of pollution and wastes on the lanes, streets, roads, public spaces and other such surroundings. Management of rivers and streams and other water bodies (such as wells, ponds, lakes and drains) and their banks and surroundings so as to keep these clean and non-polluted. A 'waste' is a 'resource' out of place. 'The polluter pays', and 'The Extended polluter responsibility'. For the Swachh Bharat Abhiyan to comprehensively be a success as an all encompassing programme for sanitation in India, it could further highlight its broad approach, concern areas, and the phasing of the Abhiyan with national and statewise targets for each major drive. It would of course also provide for the necessary institutional structures for laying down precise plans of action, monitoring the progress, delivering the results, and providing technical support. The areas of necessary funding systems need a very high priority. The Abhiyan has set its aims for the first phase (2 October 2015 – 2 October 2019). The Abhiyan can be seen as a long-term mission, with similar setting of targets for each successive phase until India can stand up to any developed country in the field of all-round sanitation including management of all the related wastes. The challenge of ensuring all-round sanitation is not merely an issue of non-pollution and cleanliness. In modern times, sanitation has huge economic outcomes also, not only in the form of providing health and hygiene (and the resultant longer productive life spans and reduced medical costs) but increasingly as savings of valuable resources by ensuring a holistic view of the life-cycle of each resource and through the 3Rs 'chains'. We need to engage in studies and analyses of the true costs to the society of having insanitation including the losses incurred through the generation of the 'wastes', and the resultant economic gains through instituting the sanitation processes in India. CW: ‘Collected works of Mahatma Gandhi’ (1958-94), vols. 1 to 100, New Delhi: Publications Division; referred to here as ‘CW vol. no. : page no. Most of the references in section B. are sourced from the book ‘Sociology of Sanitation’, by Bindeshwar Pathak (editor), containing the presentations made in ‘National Conference on ‘Sociology of Sanitation’ (2013, New Delhi), Chapters 1 to 30, Delhi: Kalpaz Publications (2015). These source references are given here as ‘[Ch. No(s). ]’.